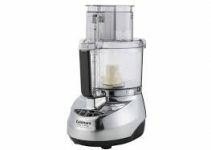 DLC-8SBCY is a Cuisinart custom food processor. It has proven track record at Amazon and is selling at quite good pace there. We have done detailed review of the product. You can check on Amazon and then read our detailed analysis of what’s been mentioned there. Its BPA free plastic and stands at almost 11 inches with feed tube at the back. The stainless finish gives more look of low-gloss silver greyish plastic. In comparison to its bigger brother ie 14 cup food processors this unit has a flatter top. So it takes much lesser space if you are short of space in your kitchen counter. It a Y unit that means the blades are not part of recall campaign. Overall its much quieter than the older model and promises a competition to other 11 cup competitors in the market. Comes with super sharp blades that will help you in pureeing meat. If you are a fan of salsa then this fellow will help you out with that. The recipe book included opens up the secret of the equipment. You can try out for yourself and learn more about this beast. Apart from understood functions of chopping onions or grinding carrot or cabbages for coleslaw this unit can also make a delicious almond butter. The motor is powerful enough to process dates but make sure that the pits are removed. If you want the food not to be scattered along the wall then try a short burst of pulses. It has a flatter top and there is a small hole in the plastic pusher so you can make mayo from it. The top lock might be difficult initially to sort out but you will get better as you use this machine more. You will soon acknowledge the safety steps are taken for user betterment only. The older models though were more user friendly but the modern safety standards are to be fulfilled as well. It’s a very compact design and will look great on your kitchen counter. If you are fan of tagging and keeping things organized than it would be good idea to review cases for its accessories. It comes with multi functioning dough blade, three slicing discs and a spatula. You should consider buying the case of blades and discs to keep things organized and well arranged. 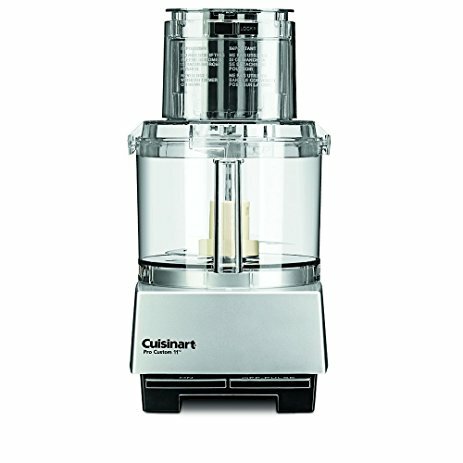 As all Cuisinart products this Cuisinart food processor is also dishwasher friendly. All part can be cleaned in a dishwasher and you can clean the base part with a rag. The touch pad is not complicated and provide 3 functions with 2 buttons. The pulse button helps you to get coarse finish with its short bursts. Releasing the pulse button the machine will stop. The on function will help you achieve more finer result. Overall it’s a very versatile machine and will enable you to do the 6 essential tasks of chopping, grinding, shredding, pureeing, emulsifying and mixing. Its is actually a plastic body not stainless steel. Some people are complaining about the lid plastic breaking but I believe that is due to inexperience. Safety locking might take you some attempts initially to understand it. 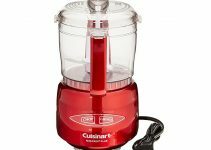 Cuisinart provides 5 years warranted single phase induction motor with this unit. The overall machine warranty is 3 years. A general rule of thumb with all processor is to not keep them ON for more than 15-20 seconds. DLC-8SBCY has a strong machine but if you want the machine to serve you for decades it’s better to stick with the old wise saying. 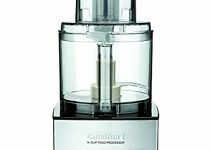 Click here to read this Cuisinart 14 cup food processor encouraging buyer reviews . If you are not sure about buying this unit then the actual buyer’s verdicts will help you finalize your decision.